Help your clients, students, and athletes develop the physical and mental skills to improve their performance on the football field. This course will explain and demonstrate techniques to assist Personal Trainers, Strength & Fitness Professionals, Football Coaches and Players, apply safe and effective sport-specific training programs. Students who successfully complete this course will earn 6.0 W.I.T.S. CECs. Course Textbook: Complete Conditioning For Football by Pat Ivey and Josh Stoner. Human Kinetics. Develop a Training Philosophy that is safe and effective for the age and experience of athletes and clients. Explain the importance of proper screening techniques of the individuals that are partaking in your football program. Explain techniques that assist with the improvement of Joint Flexibility, Speed & Agility, Muscle Power, Muscle Strength, Cardiovascular Conditioning. 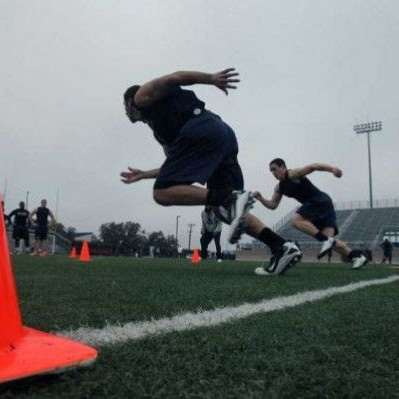 Develop workouts that are applicable to sport-specific performance on the football field.